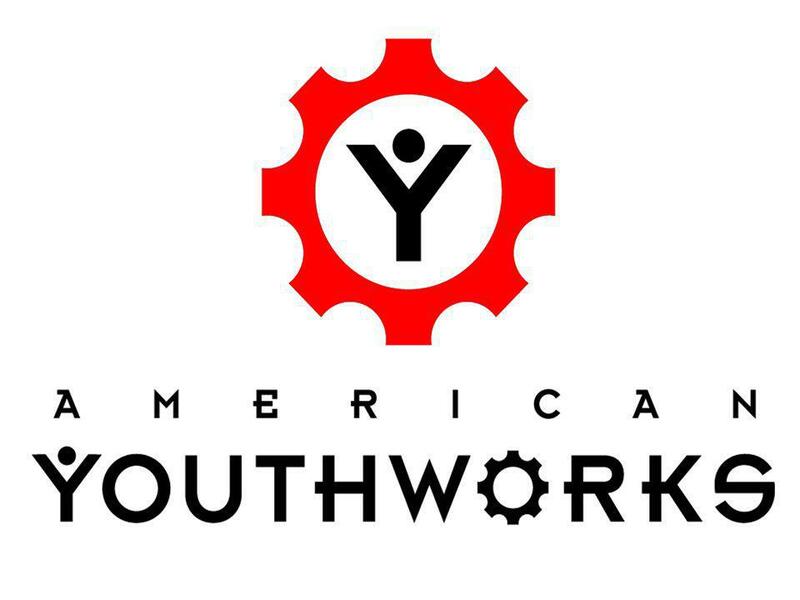 America Youth Works – Austin Introduction Toni Moreno Escalera Program Coordinator. 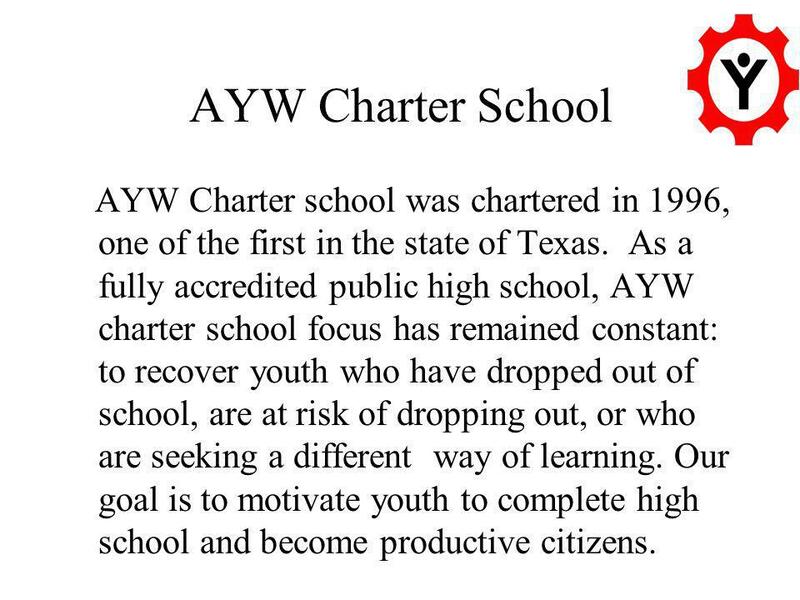 4 AYW Charter School AYW Charter school was chartered in 1996, one of the first in the state of Texas. 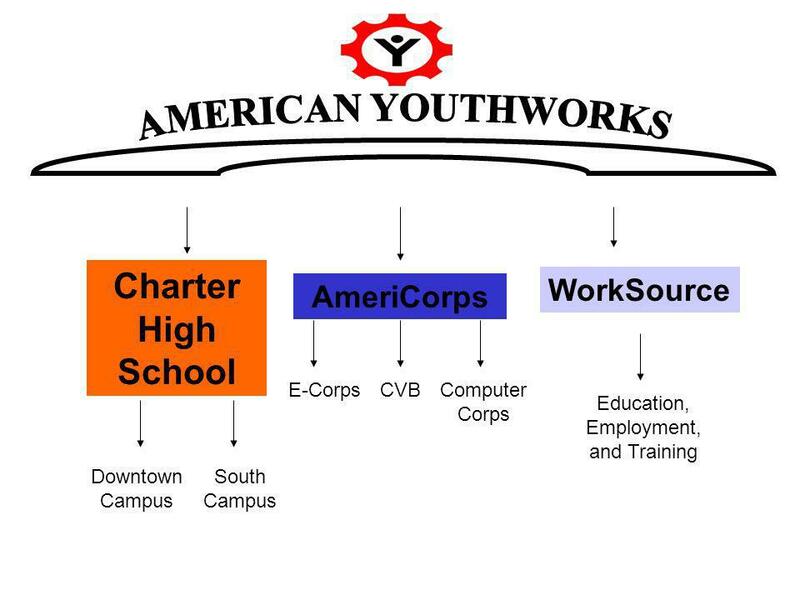 As a fully accredited public high school, AYW charter school focus has remained constant: to recover youth who have dropped out of school, are at risk of dropping out, or who are seeking a different way of learning. 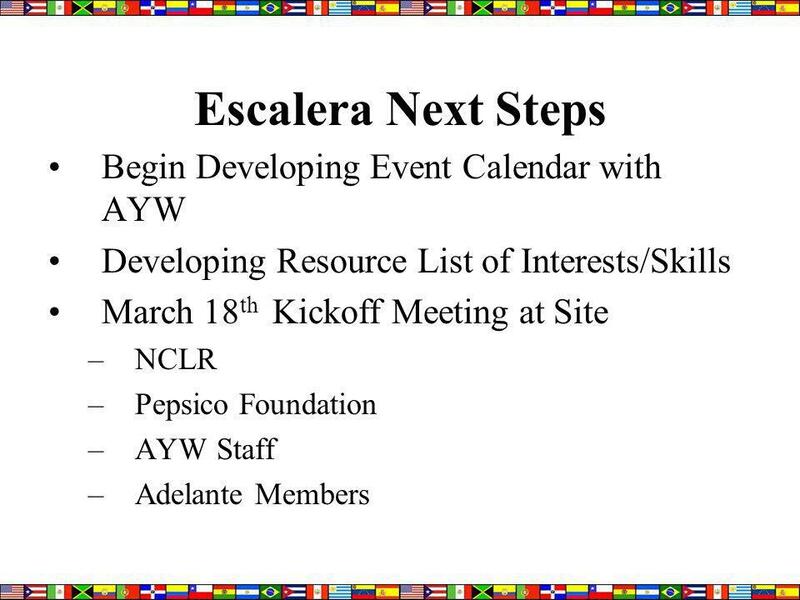 Our goal is to motivate youth to complete high school and become productive citizens. 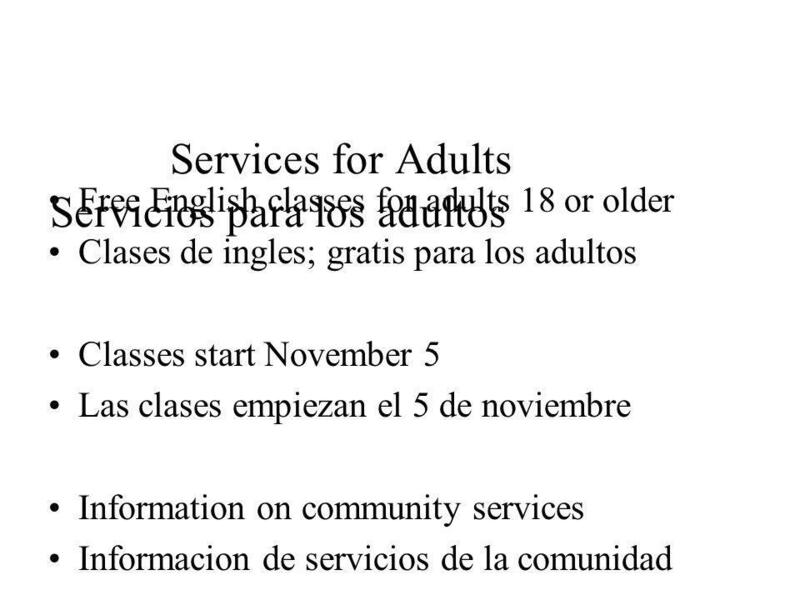 5 Eligibility Requirements You must be at least 16 and no older than 21 years of age to enroll. Must have completed 8 th grade. Interview with Principal required if you were expelled from your last school If you were assigned to a disciplinary campus from your last school, you need to complete the time assigned before enrolling in AYW. 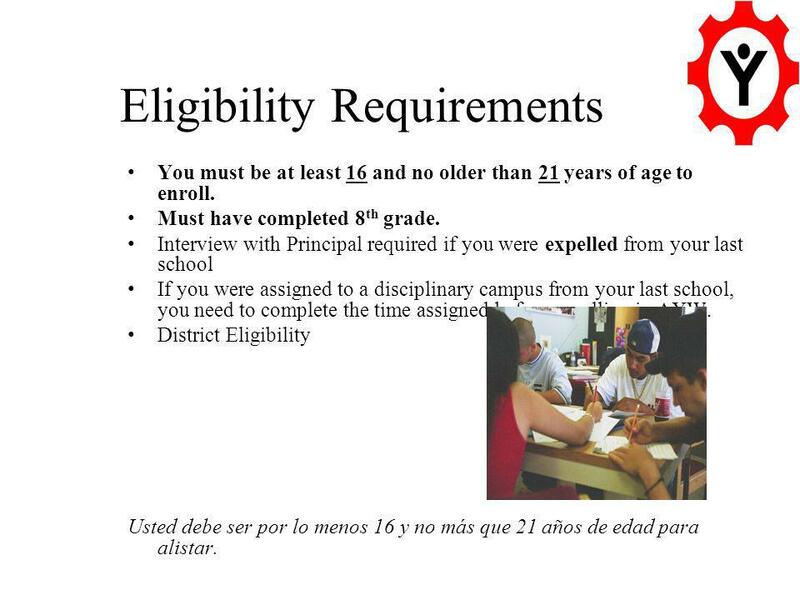 District Eligibility Usted debe ser por lo menos 16 y no más que 21 años de edad para alistar. 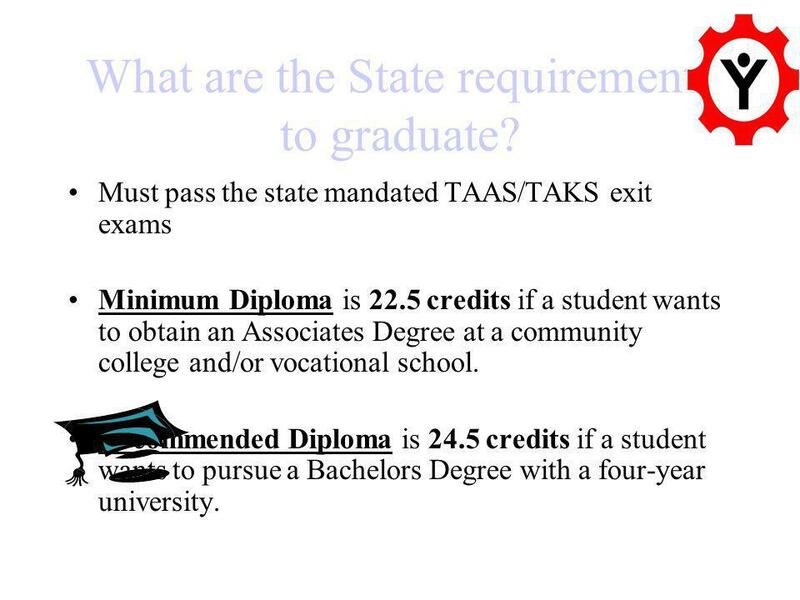 7 What are the State requirements to graduate? 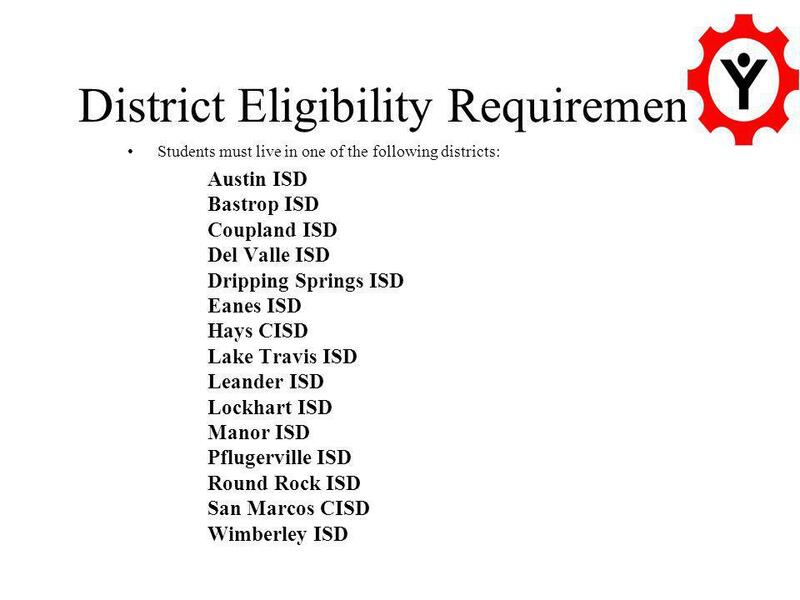 Must pass the state mandated TAAS/TAKS exit exams Minimum Diploma is 22.5 credits if a student wants to obtain an Associates Degree at a community college and/or vocational school. 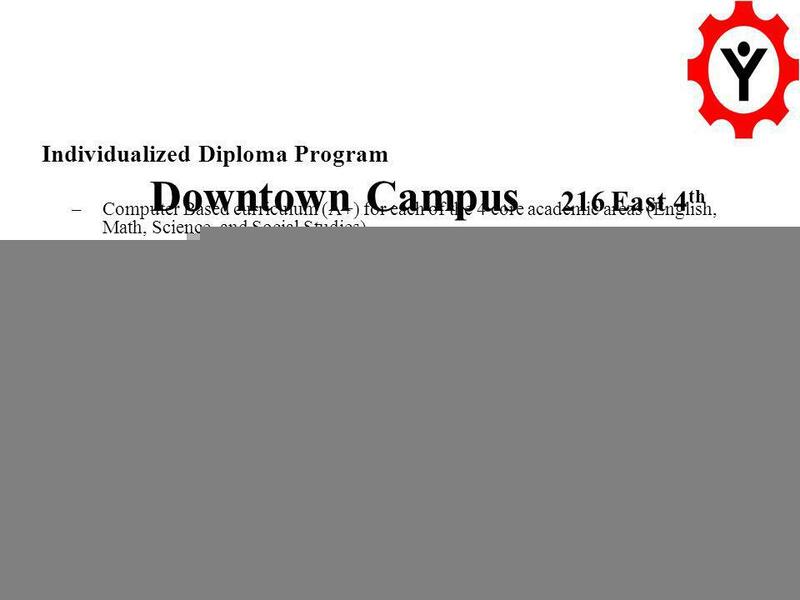 Recommended Diploma is 24.5 credits if a student wants to pursue a Bachelors Degree with a four-year university. Los estudiantes deben atender a la clase por lo menos el 90% del tiempo o perderán sus créditos. 10 South Campus 1901 East Ben White Blvd. 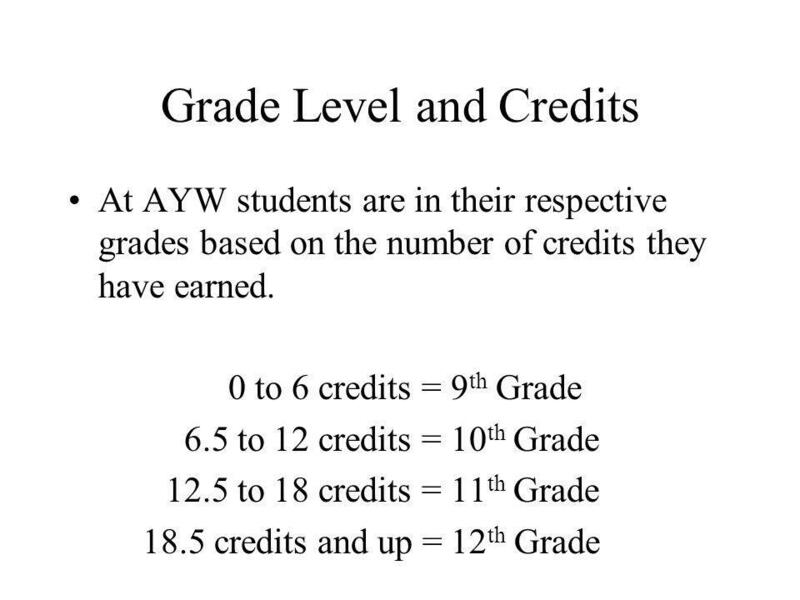 Classroom Diploma Program –Traditional classroom environment –Smaller class sizes ( Average Class Size is 18 Students Per Teacher) –On average, students have the opportunity to earn 3.5 to 6 credits per semester –American Youthworks also offers service learning in the classroom. 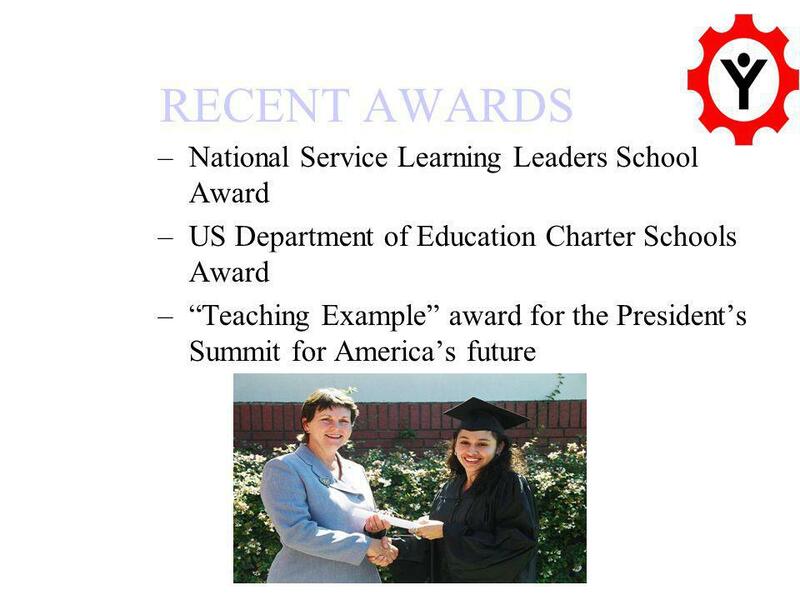 Students earn credits for completing community service projects that have been integrated into the curriculum. 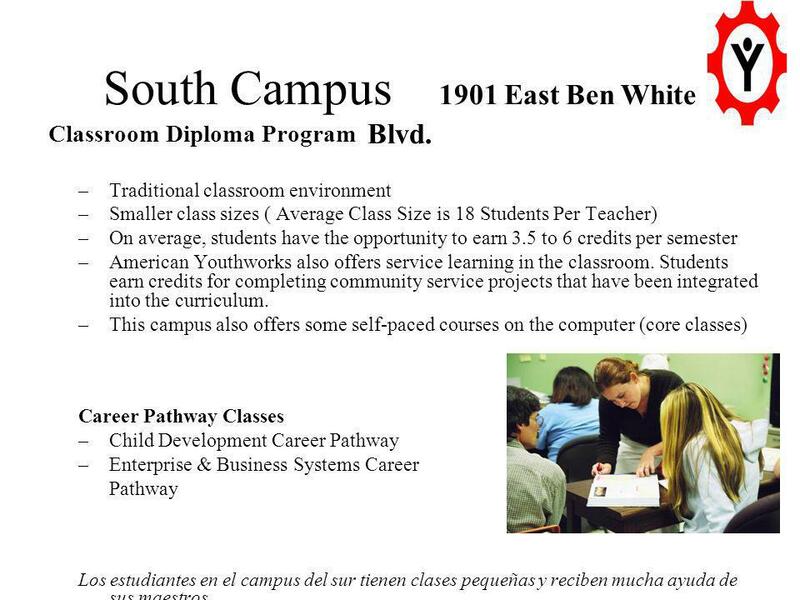 –This campus also offers some self-paced courses on the computer (core classes) Career Pathway Classes –Child Development Career Pathway –Enterprise & Business Systems Career Pathway Los estudiantes en el campus del sur tienen clases pequeñas y reciben mucha ayuda de sus maestros. 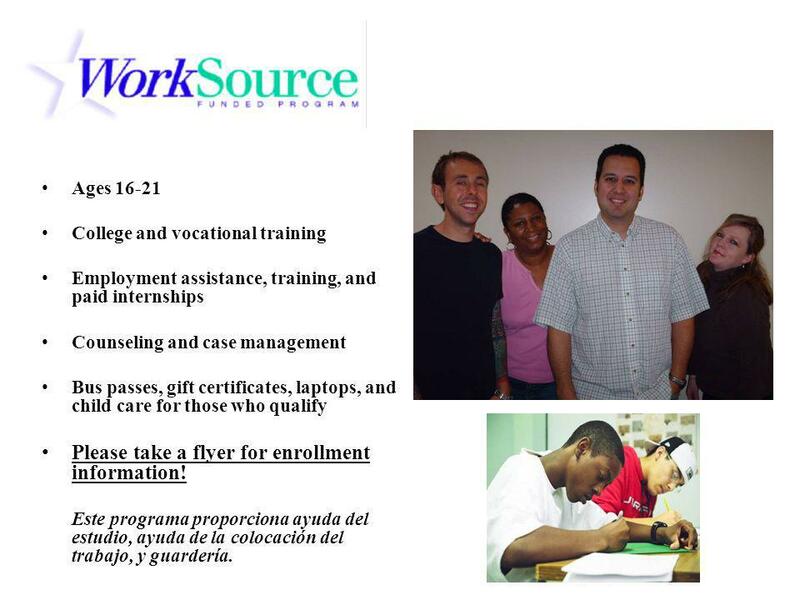 12 Ages 16-21 College and vocational training Employment assistance, training, and paid internships Counseling and case management Bus passes, gift certificates, laptops, and child care for those who qualify Please take a flyer for enrollment information! Este programa proporciona ayuda del estudio, ayuda de la colocación del trabajo, y guardería. 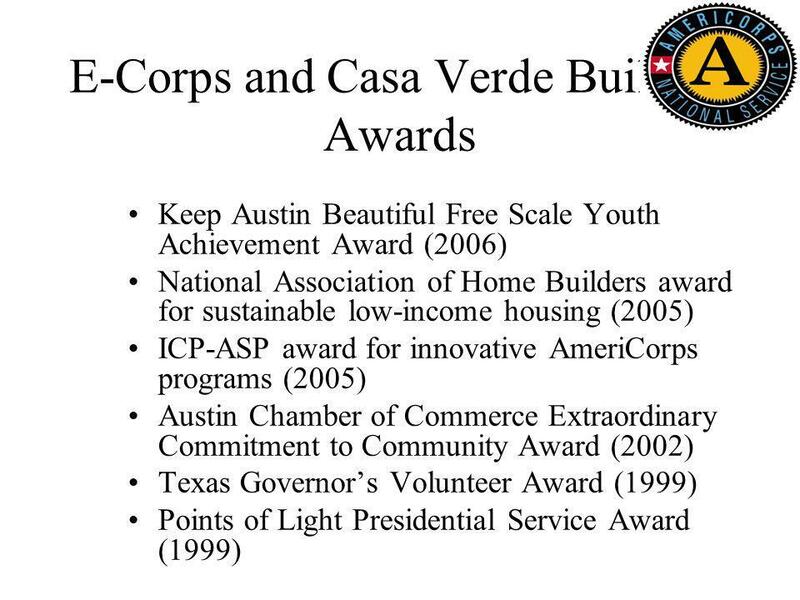 13 CASA VERDE BUILDERS Build energy-efficient homes for low-income families. 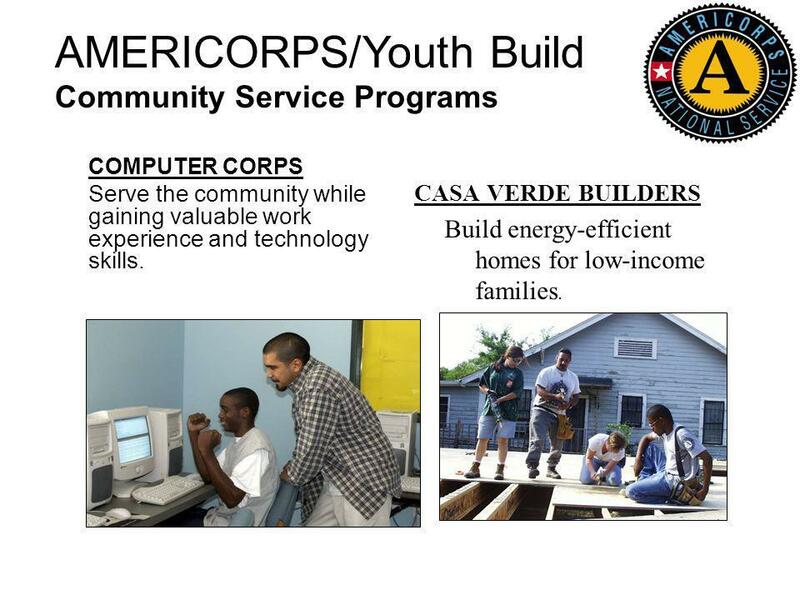 AMERICORPS/Youth Build Community Service Programs COMPUTER CORPS Serve the community while gaining valuable work experience and technology skills. 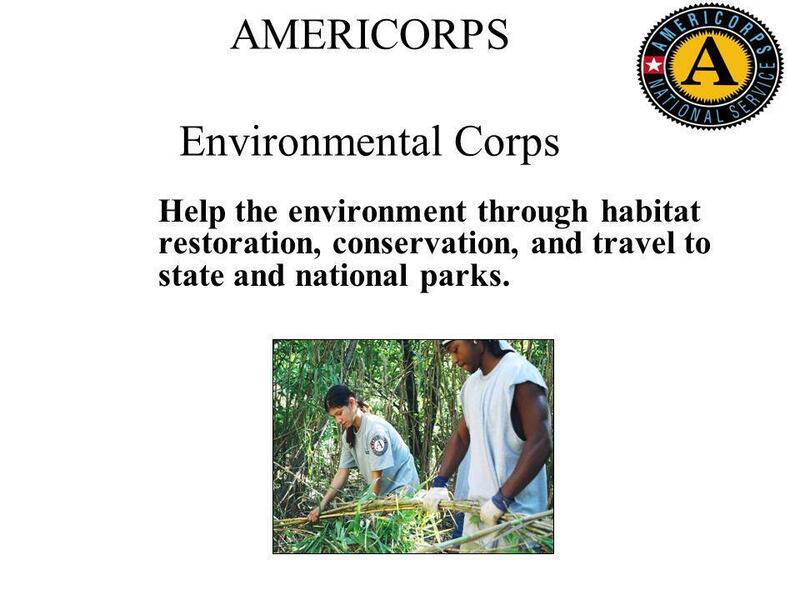 14 AMERICORPS Environmental Corps Help the environment through habitat restoration, conservation, and travel to state and national parks. 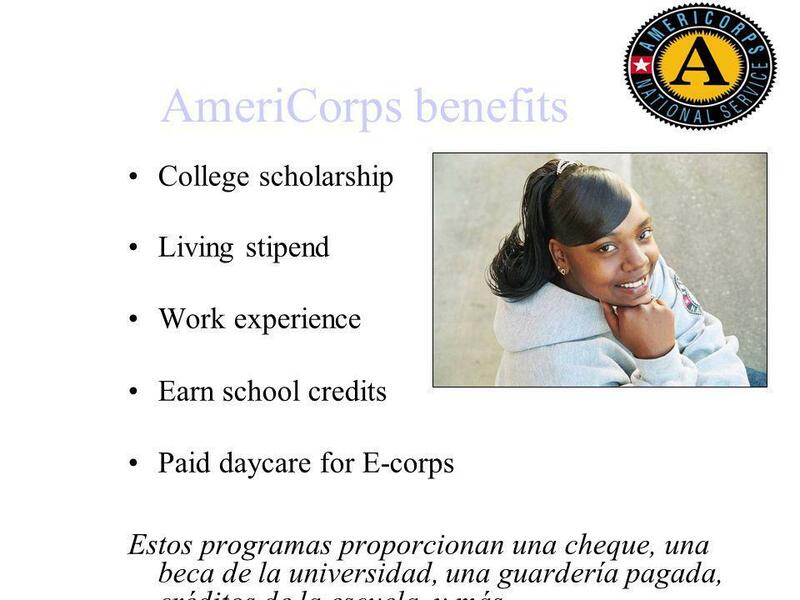 15 AmeriCorps benefits College scholarship Living stipend Work experience Earn school credits Paid daycare for E-corps Estos programas proporcionan una cheque, una beca de la universidad, una guardería pagada, créditos de la escuela, y más. 19 Thank you for coming! Congratulations! 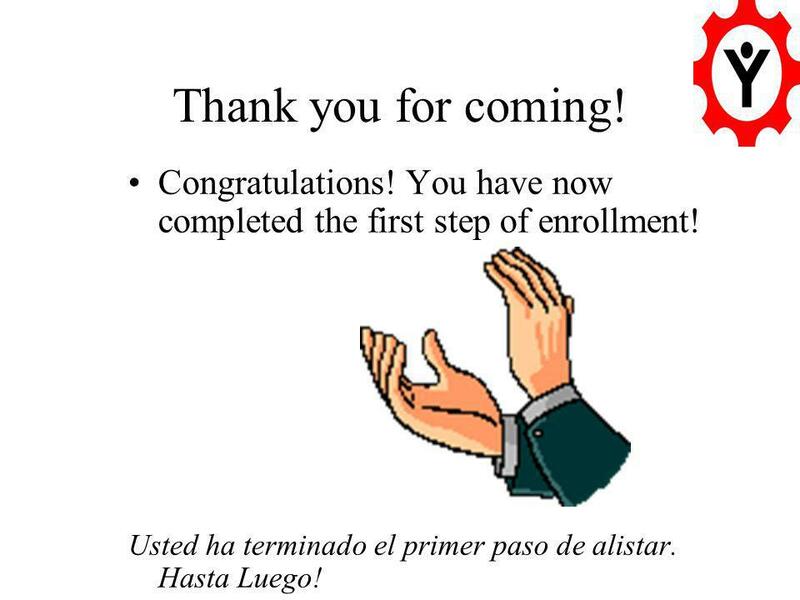 You have now completed the first step of enrollment! Usted ha terminado el primer paso de alistar. Hasta Luego! 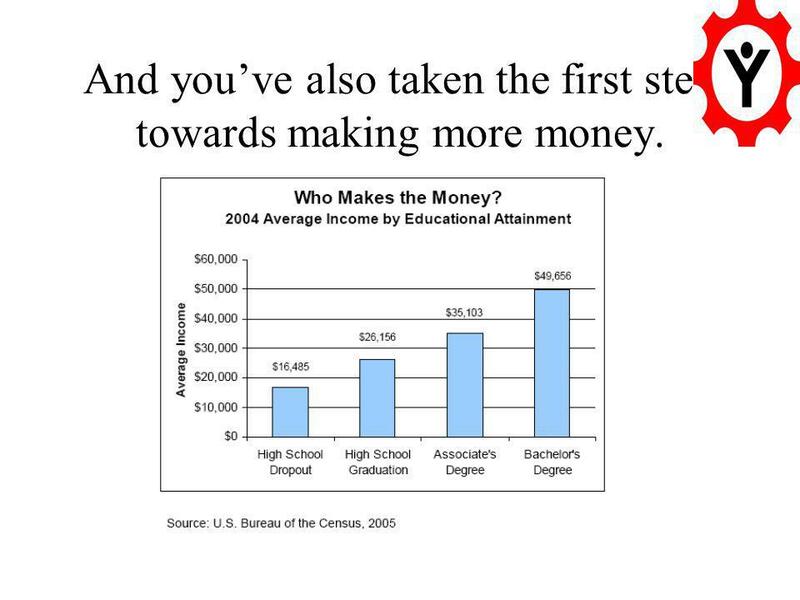 20 And youve also taken the first step towards making more money. 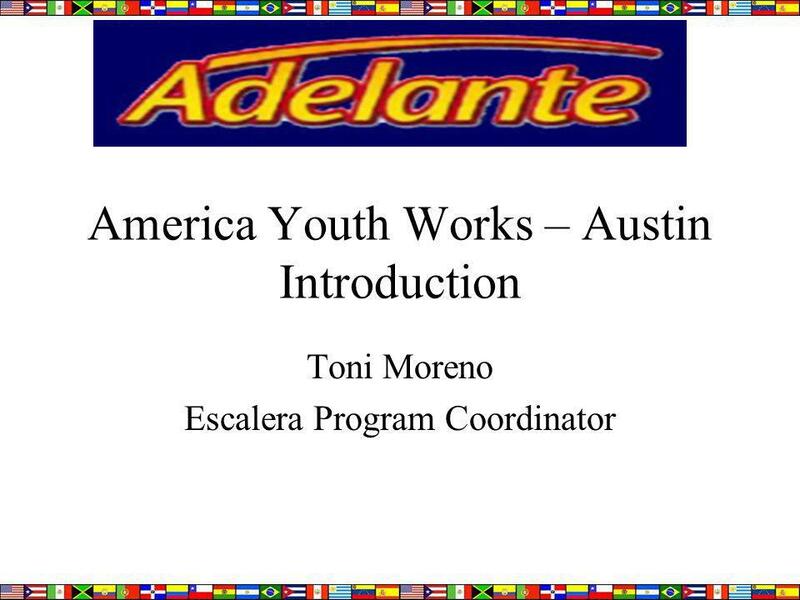 Download ppt "America Youth Works – Austin Introduction Toni Moreno Escalera Program Coordinator." Achieve Texas in Action Best Practice Guide for Educators and Local Partners. Student Populations Overage and under-credited students currently attending New York City high schools Students who have disengaged from the school system. Information Session Project LEAD Fellowships for Teacher Leaders Eliza T. Dresang, Eliza Atkins Gleason Professor Nancy Everhart, Associate Professor School. Tyra Goodgain & Debi Higbie-Holmes, Make It Happen! Innovation Grant: FYE Student Ambassadors Program ~ Information Session Montgomery College. Replication Forum October 24 th, 2013 Thank you for joining us! Florida Department of Education Office of Student Financial Assistance Florida Department of Education Office of Student Financial Assistance (OSFA) Florida. The University of Wyoming Tier-1 Initiative Stage One: College of Engineering and Applied Science The Implementation Plan for FY2015-FY2020 K-14: Initiatives. Your Senior Year Checklist Preparing For College Name Name of Chapter Date. An introduction for students and families for the 2016-2017 school year Solon High School February 18, 2016.